Naomi Osaka of Japan poses with the championship trophy after winning the Women's Singles finals match against Serena Williams at the 2018 U.S. Open. 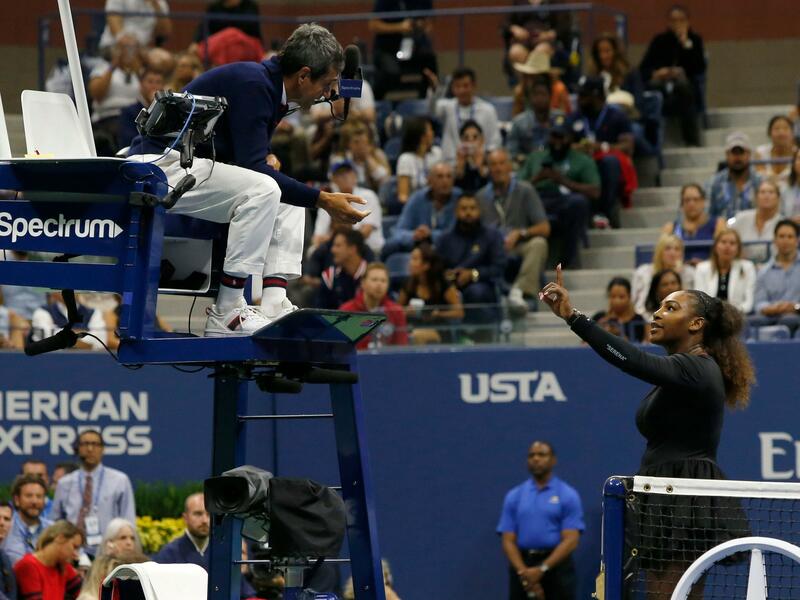 Serena Williams argues with Chair Umpire Carlos Ramos while playing Naomi Osaka during their 2018 U.S. Open women's singles final match on Saturday. Osaka, 20, triumphed 6-2, 6-4 in the match. Ramos handed Williams a point penalty later in the night after she slammed her racket down, breaking it. The confrontation continued as an audibly upset Williams approached the umpire chair and demanded an apology from Ramos, while adamantly saying that she did not cheat and receive coaching. "You owe me an apology, I have never cheated in my life," Williams yelled. "I have a daughter and I stand by what's right for her and I have never cheated. You owe me an apology. You will never do another one of my games." The game penalty happened after Williams again demanded an apology from Ramos and then called him a "thief" saying that he "stole a point" from her with the previous penalty. Ramos said the the game penalty came as a result of verbal abuse from Williams. 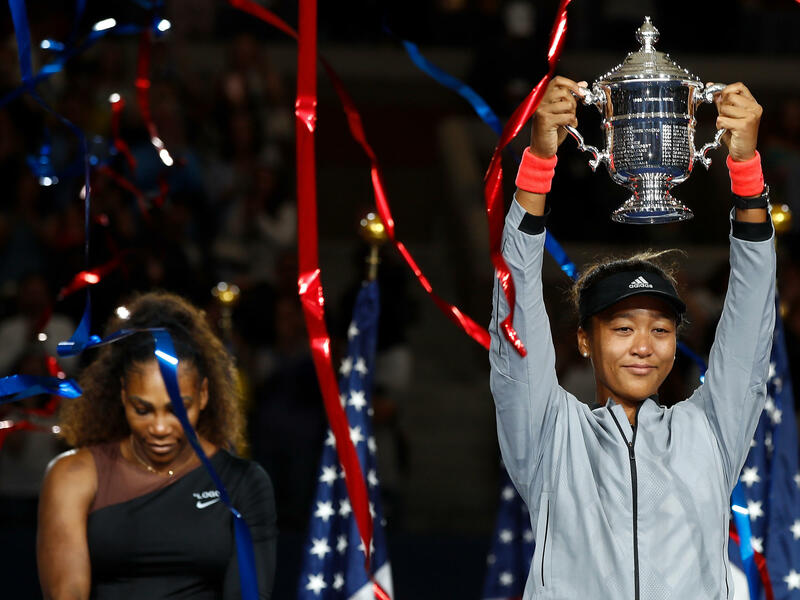 Osaka then delivered a 114 mph serve to clinch the title. The two players met at the net and Williams congratulated Osaka on the win. During the trophy ceremony, Williams addressed the crowd and its loud booing saying, "I don't want to be rude, I don't want to do questions. [Naomi] played well. This is her first grand slam," Williams said. "I know you guys were here rooting and I was rooting too, but let's make this the best moment we can and we'll get through it. Let's give everyone the credit where credit's due. And let's not boo anymore. We're gonna get through this and let's be positive. Congratulations, Naomi! No more booing." Osaka then also responded to booing from the audience. "I know that everyone was cheering for [Serena] and I'm sorry it had to end like this. I just want to say thank you for watching the match." The Associated Press reported on Sunday that Williams has received a total of $17,000 in fines for three code violations during the match. The U.S. Open referee's office is deducting $10,000 from her $1.85 million runner-up prize for her alleged "verbal abuse" of Ramos. Four thousand dollars were deducted for the coaching warning and $3,000 for breaking her racket. During a press conference, Williams criticized the calls from Ramos as sexist. "I've seen other men call other umpires several things and I'm here fighting for women's rights and for women's equality ... and for me to say 'thief' and for him to take a game, it made me feel like it was a sexist remark," Williams said. "He's never took a game from a man because they said thief. For me, it blows my mind. But I'm going to continue to fight for women."